If you're looking for an easy apple dessert that looks great and tastes delicious, you'll want to try this phyllo dough recipe. These little morsels are the perfect ending to a special meal. I used to be intimidated by the thought of using phyllo pastry. Phyllo desserts look so delicate that I thought that they must be hard to make. As so often happens with cooking matters, I was wrong! What is phyllo dough anyway, you ask? It is paper-thin wheat flour dough. You can buy it premade. Look in the freezer section of the supermarket. The trick to working with phyllo is working quickly. Be sure to have all of your materials and ingredients assembled so that you can get the phyllo dealt with before it dries out. This easy apple dessert recipe makes 12 tarts. Get out a muffin tin. Put the diced apples, maple syrup, cinnamon and nutmeg into a small saucepan. Cook over medium heat until the apples are soft. Meanwhile, cut the phyllo into squares, each about 4 inches/10 cm square. Press a square of phyllo into a muffin cup. Press another square on top. 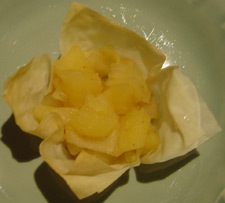 Bake the phyllo cups until they are golden brown (about 5 minutes). Watch them carefully - they burn quickly! Take the cups out of the oven, fill them with the apple mixture, and serve. Use honey in place of the maple syrup. Try adding another fruit to the mixture. How about some diced peaches, or some raspberries? Pastry shears work really well for cutting the phyllo pastry. A silicone brush makes it simple to brush on the melted butter. Melt the butter either in the microwave, in a saucepan on the stove, or in an ovenproof bowl in the oven. I don't know what I'd do without my apple corer! Just remove the core and slice the apple into slices. Then it is easy to peel the slices and dice them up. These tarts are a bit messy to eat by hand; you may want to use a spoon. This recipe uses just a little bit of phyllo. Quickly take out the amount you need and return the rest to the fridge. Use it within a couple of days. I like to use the remaining phyllo to make Spanokopita! It's much easier to make than I imagined. Return from easy apple dessert to healthy dessert recipes.